Thanks to Fedex, both of my orders that made last week arrived today in spite of the snowstorm. 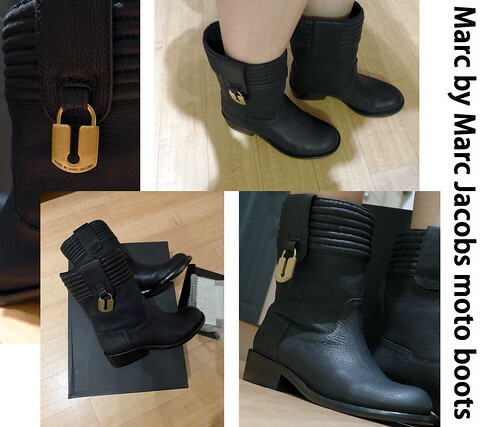 I could not wait to share my satisfaction of Marc by Marc Jacobs moto boots, as well as a quick review, with you! The quality of the boots is way better than what I expected (according to my previous experience of Mbmj shoes). They have leather upper, lining and sole. The 1 1/2 '' heel and the cushioned arch support (which leaves no gap between your feet and the insole) make them extremely comfortable! They are true to size (and width). Pull-on style is good for leggings, jeans and short skirts. By the way, I heard some complain of Salvatore Ferragamo riding boots which may make your feet look longer than they are; this is not the issue for this pair. I think your blog's old layout is way better than what it is now.. Sorry! Can't agree more. Used to enjoying reading your blog, simple and elegent (both the people and the website) It now looks like one of many low commercial site flooded by Ads. Sorry! Really miss old layout. Now it is more commerical. I too like the old format better, sorry. You are going to step by step to build your commercial website, right? Building up a website is definitely fun for me, full of new knowledge to learn! I never imagine myself learning to write a template! Whether it will be a commercial one, I don't really think so. There are many excellent bloggers (as I put in my reading list), who I still won't use commercial on theirs. I treat my blog as my home, adding features and changing decorations, back and forth. Bottom line, I enjoy sharing information with all of you. How do you feel the trading of electronic products in 1998, you will be a rich very very good content of this site?